Drooling over Sonam Kapoor’s lehenga choli look with sunshades in Dolly Ki Dolly or Prem Rattan Dhan Payo? Umm, if that doesn’t inspire you, how about something like Katy Perry’s desi-style wedding with sunglasses and a ‘nath‘? FYI, this look got sold like hotcakes abroad. With all the hoo-ha about how to make it different or spice up your wedding ensemble, we have concluded one thing - the new-age bride isn’t afraid of wearing her sassy style on her eyes and has no qualms about flaunting her over-the-top feminity. So, brace yourself lovelies as we tell you how modern brides can rock the sunglasses look. We never knew that a simple pair of aviators can work its magic and give your lehenga a 360-degree spin. Do you remember how the quirky former Miss India, Gul Panang, sported dark aviators and a beautiful embellished pink lehenga? Adding a whiff of originality to the otherwise ‘I-am-stale’ bridal look, she created a fashion trend for lasses who plan to tie the knot soon. To make it more interesting, her groom and all the wedding guests came dressed with sunglasses in the sidecar! What could be more sinful than a gorgeous kanjeevaram saree, heavy gold jewellery, kamarbandh and bridal tika with dark shades? For all the South Indian brides out there, this look can make you steal the show completely. You really don’t have to be a celebrity to try something new. You could be the normal beauty who knows how to quirk things up at her wedding. If you’ve tried this one, you’d know. Did anyone even look at the groom? 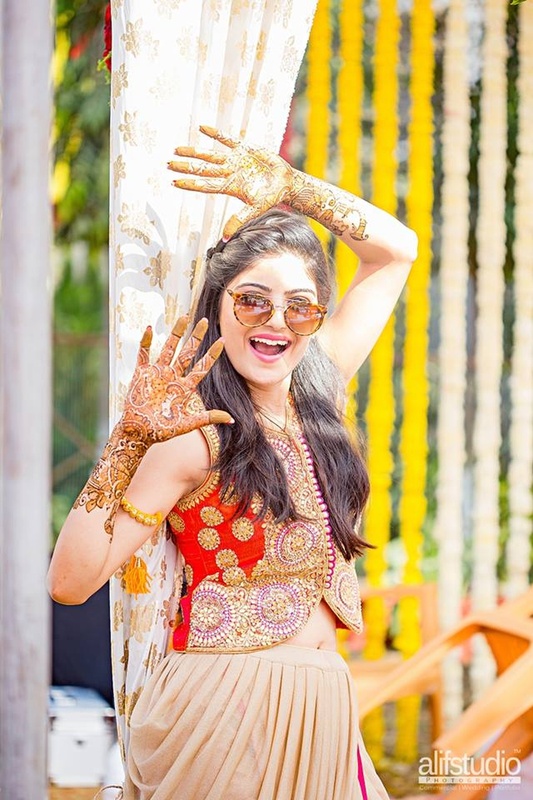 We are totally crushing upon chic ladies putting up the cool bride act with panache. Love it when all the dulhan’s friends gang up for photo shoots and explode the scene with playfulness. You can seek inspiration from weddings where the baraatis have fun in the darkest of shades. It doesn’t matter if the venue is indoors or at the beach side. Does it even hurt to get transformed into a demigod with black sunglasses? How difficult could it possibly be to step into the mesmerising 1950’s era with just a simple pair of cat-eye frames? You could opt for glasses embossed with stones on the rim or funky add-ons. Not for the faint-hearted, they are perfect for draped sarees or off-shoulder blouses. All you need to do is keep the lips bold, the hair neatly tied in an updo and voila! You just command the moment and steal more than just the thunder! While you put this look together, here are a few things you need to be careful about. - Opt for pinks, browns, whites, creams and beiges for the conventional route. Whether you want to keep it subtle or flashy, please avoid the temptation of matching the colour of your sunglasses to your lehenga or saree. - Avoid blingy shades at all costs. Hey, look at yourself in the mirror. Aren’t you already excessively decked up with jewellery, hair, and makeup? - Aviators are ultra-chic, but they also have an androgynous look. If you are wearing something very girly and coralish, pick frames like wayfarers to get a soft look. - You need to be doubly sure with black sunglasses. Though they are hatke, wear them only when you can carry them with confidence. We don’t like a stroppy look (nor do the camera lenses)! So, it is time to say ‘Eye Do’ in style and give sunglasses a shot. It is sure to add a whacky twist to your wedding!